NEW: Spray 300 T - Multi Chine ALUMINUM Pilot House trailerable. above makes a great, easy to build multi-chine ALUMINUM cruising sailboat ! Centennial Spray 300 - Round Bilge Wood Epoxy - trailerable. Delivered by DOWNLOAD to your computer within 12 hours of you placing your order. The study plans have lists of materials & equipment etc & these will be useful in costing out the complete boat. Each plan contains all the construction drawings for WOOD EPOXY construction, plus bonus drawings covering electrical, plumbing and engineering, everything you need to build your boat. 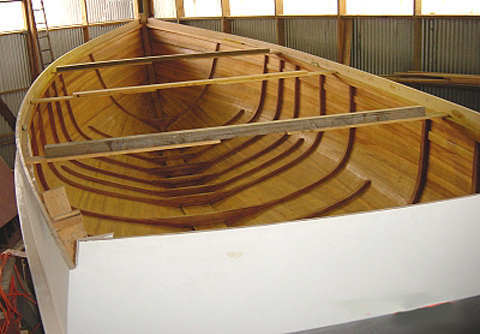 Boat plans & Full Frame Patterns - Round Bilge WOOD / EPOXY or MULTI CHINE ALUMINUM construction. This Centennial Sprays 30 is designed for building in Wood/Epoxy, and can be rigged with as Bmu cutter. Custom gaff schooner, junk rig etc sail boat plans and additional accommodation layouts may be drawn to suit your requirements for a reasonable fee. 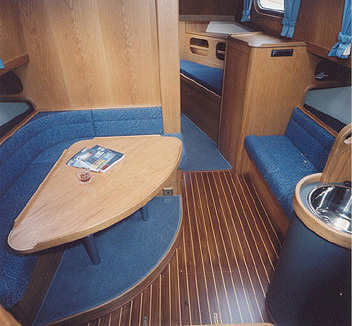 THIS IS A GREAT TRAILER SAILER or SMALL OFFSHORE CRUISER !! L.O.D. 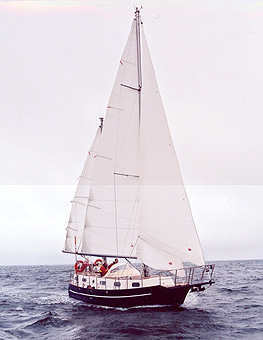 ( HULL) 10.59 m 30' 6"
L.W.L. 7.79 m 26' 1"
BEAM ( Trailerable version ) 2.59 m 8' 6"
BEAM ( Offshore cruising version ) 3.35 m 11' 0"
Here we see the CS30 fitted with the cutter rig ... This boat will accept a variety of rigs. sleeping. Above version sleeps 4 in forward double plus 2 pilot berths. The accommodation layout may be varied to suit your personal requirements. Here we show two of the possibilities that are included in the boat plans. STUDY PLAN PACKAGES ON DOWNLOAD or on USB - YOU CHOOSE DOWNLOAD OR USB . . . GIVE ACCESS TO HUNDREDS OF step by step BOATUILDING PHOTOS . . . .and of course this information is included in the plan package as well.